Open Text Corporation develops and sells Enterprise Content Management (ECM) solutions primarily in North America and Europe. Its products enable corporations to manage traditional forms of content, such as images, office documents, graphics, and drawings, as well as to manage electronic content, including Web pages, email, and video. They facilitate document management, collaboration, social media, Web content management, digital asset management, records management, email management, archiving, capture and delivery, business process management and content reporting. Open Text has over 46,000 corporate customers servicing 50mm users in 114 countries. Open Text is a $2.2B company. The PEG of less than one indicates the stock is not currently expensive. On the other hand, ratios like Price-to-Sales and Price-to-Book are not quite in the range expected for a value stock. But as a growth stock those ratios are not so important. What is important is a measure of growth. Here, things are split. Quarterly revenue growth is strong at 15.8% year-over-year. Quarterly earnings growth, however, has been somewhat erratic and was hurt by bad results in the most recent quarter. The following tables show how revenue has been steady but earnings occasionally take a dip. After a bad quarter the trailing PE is a high 48 but the forward PE is a quite reasonable 12. In other words, growth expectations are strong. The company just garnered a recommendation from Canaccord Adams. The target price was upped from $38 to $48. A Canaccord analyst says they "expect a sequential pick-up in demand" and that "more material improvements in spend are projected for the first calendar quarter of 2010 based on our checks with industry participants. We believe that consulting utilization rates have begun to quickly improve in recent weeks because enterprise accounts are aggressively planning new projects that were deferred over the past 12-18 months." In other words, growth is on the way. Furthermore, Canaccord has raised expectations that new product lines involved in the management of mobile and social media channels will begin to make more significant contribution to earnings now. I've written before how the enterprise software sector is less volatile than many other tech sectors yet delivers solid growth. 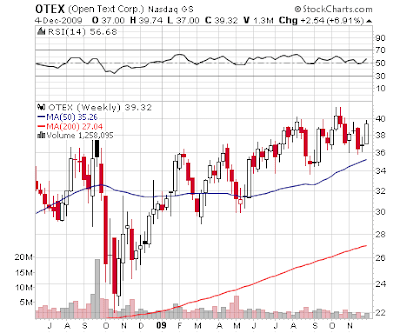 Open Text fits well into this concept as the weekly chart above shows. The Canaccord analysis seems reasonable enough. My own feeling is that Open Text is well positioned for an era where more companies are generating more and more documents that need management and collaboration across time zones and continents. As a leading company in document and content management, Open Text should be able to surf a rising tide in a growing niche.